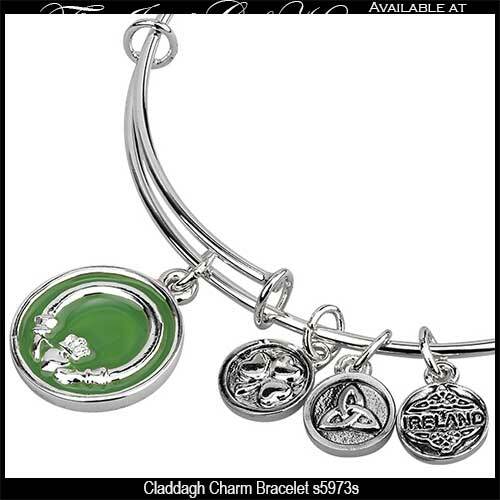 This Claddagh bracelet is an expandable wire charm bangle that is enhanced with green enamel accenting. This rhodium plated Claddagh bracelet is a expandable wire bangle that features a 5/8" wide Claddagh charm that is enhanced with green enamel. Additional charms are the 3/8" wide Trinity knot and shamrock along with a Celtic knot enhanced Ireland charm. The bangle is designed to fit most women's wrists is crafted by Solvar Jewelry in Dublin, Ireland. 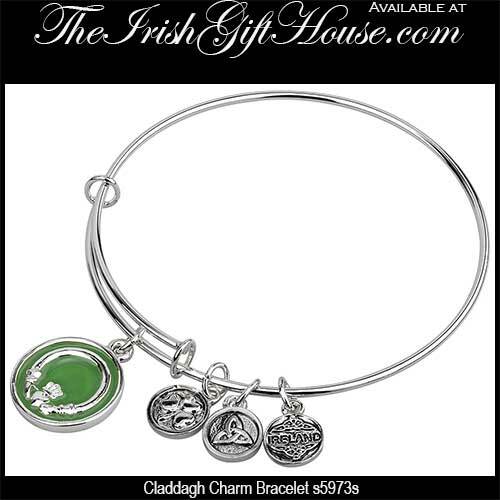 The Claddagh charm bracelet is gift boxed with the respective history cards that are complements of The Irish Gift House.